We knew Activision's upcoming Transformers: Rise of the Dark Spark combined two Transformers continuities. Now it's three, as the original Optimus Prime arrives to show the other two how it's done. The Next Transformers Game Crosses Continuity Lines. I&apos;m Scared. Maybe that's not a good thing. Having recently rewatched the entire original Transformers cartoon series, I've come to the realization that Optimus Prime was not a very good leader at all. He made bad decisions, showed poor judgement — all he really had going for him was he was the tallest, most of the time. That's probably why he's only playable in Escalation mode. Now that I think about it, movie Optimus Prime isn't much better. He let Megatron and his folks kill countless people because he didn't want to give him the Allspark — which he knew would kill Megatron if he tried to use it. Dumb. The Optimus from War for and Fall of Cybertron comes closest to being the hero the Autobots deserve. Well, he seems to have evacuating a planet down to a science. That's all he's really been in charge of for the past two games. They shall remember him as the Great Evacuator. Nobody leaves as well as Optimus Prime. 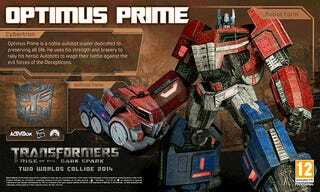 Transformers: Rise of the Dark Spark and its three Optimi Prime will be arriving on Xbox One, PlayStation 4, Xbox 360, PlayStation 3, Wii U, PC and 3DS later this year.